A thin client is a stateless, fanless desktop appliance that has no hard drive. All features typically found on the desktop PC, including applications, sensitive data, memory, etc., are stored back in the data center when using a thin client. A thin client running Remote Desktop Protocols (RDP), like Citrix ICA and Windows Terminal Services, and/or virtualization software, accesses hard drives in the data center stored on servers, blades, etc. Thin clients, software services, and backend hardware make up thin client computing, an alternative desktop computing model. Many users ask: What is thin client computing? Thin client computing is a concept that has been around for decades. During the late 70s, a “dumb terminal,” or a computer without a hard drive, were being used. They were similar to a thin client in that all processing was done from the CPU or computer they were connected to. A dumb terminal was simply an output device or display monitor that had no computational power to do anything besides display, send and receive text. Thin client computing has advanced drastically in the last decade and can today rival traditional PCs in performance. Thin client computing has advanced to the point where users can’t tell the difference between a thin device and a “fat” PC. This user experience, coupled with the extensive cost, security, manageability, and scalability benefits of thin clients, is the reason IT personnel in various industries are exploring – and switching – to alternative desktop computing. 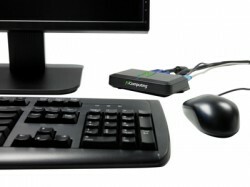 Thin clients have normal connections for USB drives, scanners, printers, speakers and keyboard and mouse. Any place where security is an issue typically benefits from some type of thin-client setup. Data is kept on the backend; the client only presents the user with whatever they are authorized to see, and tampering with the client generally only results in a broken client instead of stolen data. Thin clients are also useful in public environments — libraries, government offices, airlines, Internet cafés — where many people may use the same machine, and there’s a need to reduce the amount of risk due to leftover data from previous sessions. The risk is not eliminated — it’s always possible to “shoulder-surf” someone else’s work — but it is reduced by dint of there being minimal data on the terminal itself. Thin clients are well-suited to workloads where the actual work being done is not CPU-intensive, and requires only as much client feedback as would be provided by a web browser. In fact, many such thin clients may well be web browsers, since they provide toolsets to cover most of the user interaction you might need in such a scenario. One common scenario for repurposing older PC hardware is to convert it into a thin-client system of some kind. 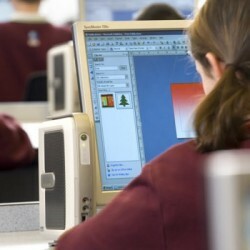 Applications that would not run well on the PC itself could be published from a server to that PC across a thin-client connection, provided the app’s functionality wouldn’t be hindered that way.